On the 5th Sunday of the month (4 times a year), the First Congregational Church makes and brings sandwiches and other items to the Outdoor Church congregation in Cambridge. Our tradition is to make the sandwiches in the kitchen after worship on “our” Sunday using ingredients donated by the Congregation. 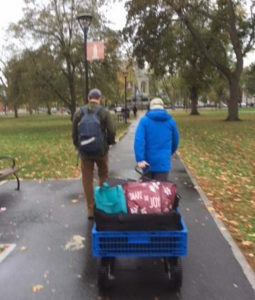 Two to five members of the congregation volunteer to deliver the food and to spend a few hours with the clergy of the Outdoor Church following a route around Harvard and Central Squares offering food to those who are hungry. There are some people who are ongoing members of the Outdoor Church and some we will only see once or twice. This sign up is to gather the ingredients needed. Our next Sunday is September 30th – you can deliver ingredients to the church kitchen the week prior to that date. Click here to sign up!